See Predecessors at the Frances Young Tang Teaching Museum! Njideka Akunyili Crosby is at a pivotal moment in her career. Last month, the Nigerian painter and 2011–12 Studio Museum artist in residence was named a 2017 MacArthur Fellow. Her solo show, Front Room: Njideka Akunyili Crosby – Counterparts, opened at the Baltimore Museum of Art in October, and last month she debuted new work at Prospect New Orleans. Opener 30: Njideka Akunyili Crosby – Predecessors at the Tang Museum at Skidmore College in Saratoga Springs sheds light on the artist’s practice, while emphasizing the cross-cultural, intergenerational influence behind her work. The show us up through the end of this year, and a great opportunity to see an exceptional contemporary artist. This exhibition is the first to unite the major works from Akunyili Crosby’s Predecessors series, in which the artist depicts her late mother—who was a prominent Nigerian politician—her sister, and herself all set within her grandmother’s home in Lagos, Nigeria. The imaginative works examine her relationship with loved ones, along with her own cultural background. 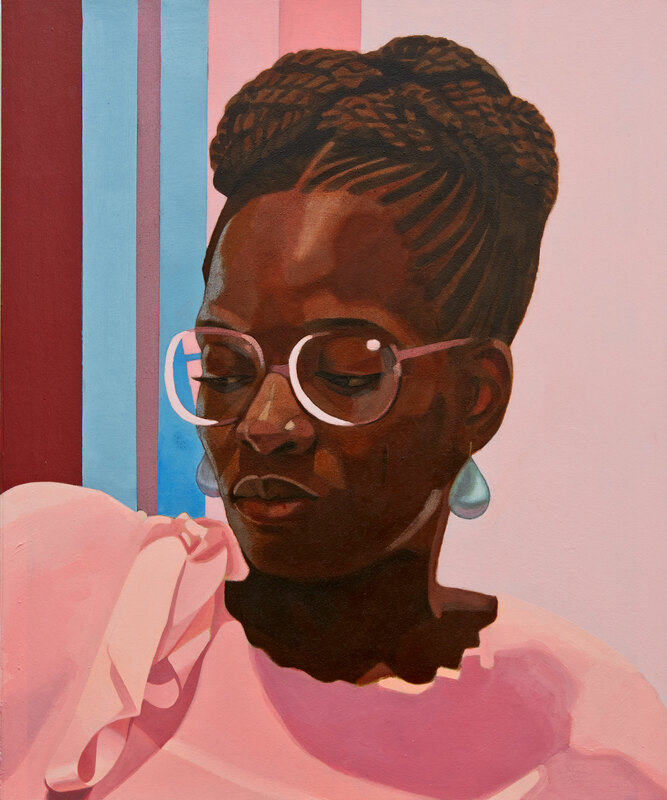 Featuring a selection of portraits and still-life paintings, the show explores powerful themes of race, gender, family, and identity in the frame of a post-colonial country in social and political flux. Her figures actively resist stereotypes, and offer complex and nuanced images of black identity through an innovative approach to painting. Akunyili Crosby (b. 1983) left Lagos for the United States at the age of sixteen to attend Swarthmore College, where she earned degrees in biology and studio art. Now based in Los Angeles, much of her work engages with her Nigerian upbringing, her immigration to America, and her interracial marriage as she explores new and old narratives of identity and heritage. Her bold, large-scale paintings of domestic scenes and quotidian settings have garnered her international attention, incorporating material references to her Igbo tribe’s customs through intricate collage, printmaking, painting, and drawing. In combining commercial images from Nigerian pop culture with photographs of her loved ones, Akuyili Crosby not only blurs the line between our personal and shared histories, but also references Nigeria’s colonial past, while subverting the Western art canon. Her figures actively resist stereotypes, and offer complex and nuanced images of black identity through an innovative approach to painting. The monumental paintings presented in Predecessors are both deeply personal and thematically universal in their portrayal of diasporic communities. Akunyili Crosby portrays those closest to her in intimate detail, but intentionally leaps across spans of time, space, and culture to allow her audience to identify with her subjects and relate their own narratives. Opener 30: Njideka Akunyili Crosby – Predecessorsis co-curated by Ian Berry and Steven Matijcio. The exhibition is co-organized by The Frances Young Tang Teaching Museum and Art Gallery at Skidmore College and the Cincinnati Contemporary Arts Center. The exhibition will be on view at the Tang Teaching Museum and Art Gallery through December 31, 2017.